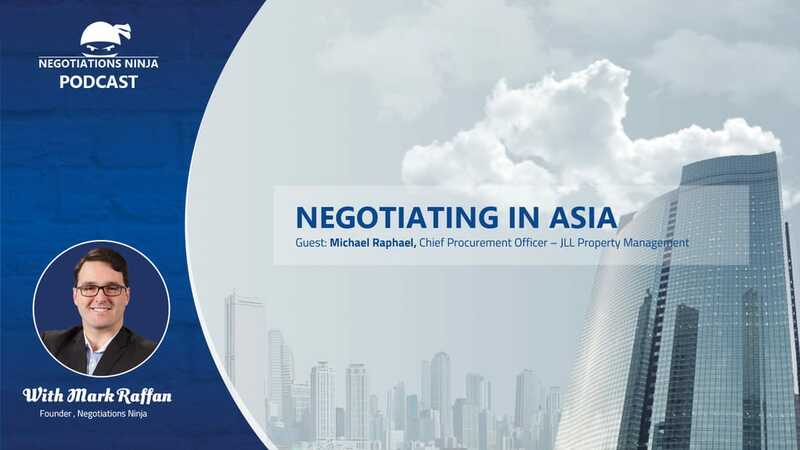 Michael Raphael is the chief procurement officer at JLL, a property management firm that is multinational, but he’s based out of Asia. With 30 years of sourcing experience, Michael has worked with a number of global multinationals. He has previously led the procurement function for the largest listed property trust in the world, as well as running indirect sourcing for Australia’s premier department store. Prior to JLL, he was managing director of the Hong Kong division of a U.S. promotional items company that focused its work within the pharmaceutical industry. Having been based in Asia for 11 years, he has a deep knowledge of the manufacturing base in China and, likewise, a deep knowledge of negotiation practices in Asia. And that’s what we focus our discussion on. In the west we’re sometimes guilty of being quite egocentric in thinking that our way of negotiating is the way people all over the world negotiate, and that simply is not true. So how should you negotiate in Asia?